Show off your skills, make new friends, and explore your future. Every year, TAME brings together students to compete and celebrate achievement in science, technology, engineering and math (STEM). 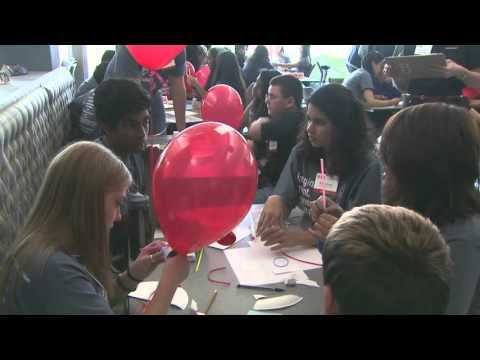 During a STEM Competition, students participate in both a math and a science test, and then team up in different engineering roles to solve real-world problems in a timed Engineering Design Challenge. TAME Chapters across the state host Divisional STEM Competitions in winter. Out of those participants, 300 high achieving students from Divisionals are eligible to receive an invitation to the State STEM Competition in spring. What happens at a STEM Competition? IDEAS START FLYING. 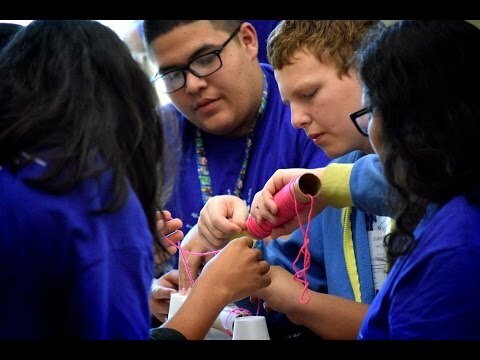 The 32nd annual TAME State STEM Competition was sponsored by Boeing and hosted by CPS Energy in downtown San Antonio on Saturday, April 8, 2017.
Who can compete at the Divisional Competitions? TAME students in grades 6 - 12 who are active members of a registered TAME Club can compete in a Divisional Competition. Students must participate and qualify in a Divisional Competition to receive an invitation to the State Competition. For information about Divisional Competitions in your area, check your local Chapter. What happens at the Divisional Competitions? Participants take a timed math and science test administered by grade level that will combine math and science, including questions from both subject areas. Students also compete in an Engineering Design Challenge at the event. In addition to testing student knowledge of math and science concepts, the competition promotes teamwork, leadership, and academic achievement. To participate in TAME activities like Divisional Competitions, you need to be a member of a TAME Club. Our clubs are free and require only eight students, an Adult Sponsor, and regular meetings about STEM in person. IMPORTANT: Membership with TAME is a two-part process. It begins with annual Club Registration. Once the Adult Sponsor registers the TAME Club for their school or organization, then the students in their club need to complete their Student Registration. DEADLINE: If you are in grades 6-12 and want to participate in the Divisional or State STEM Competitions, the deadline to register Clubs and Students online is Wednesday, November 7, 2018. Students who do not register by the deadline are still welcome to register and participate in the activities hosted by their TAME Club. Graduating seniors must complete Student Registrations to apply for 2018 TAME Scholarships in the spring semester when they become available. How can I get ready to compete? Are there practice tests and challenges? Students who want to train to compete can take practice tests. For our Engineering Design Challenge, TAME’s Blog features Engineering Adventures. You can also visit TAME's Engineering Activity board on Pinterest for over 200 design challenge ideas that you can try with friends in the classroom or with your family in your own living room. I want to know about competition strategy. Is it okay to guess on test questions? What about tie-breakers? As you take your practice tests to train for Divisional or State competitions, you might wonder whether we have any special rules. You will be glad to know that we do not penalize students for wrong answers, so we strongly encourage you to complete the whole test and not leave any blank answers. Think like a scientist or an engineer--it's better to make your best guess and see what happens, than to hold back because you don't know for sure. In the STEM world, the only failure is in not trying. Tie-breakers at a STEM Competition will be settled by comparing the tests to find the first incorrect answer or skipped question. What are the tests like? Can I use a calculator on my test? What about a Periodic Table? Students in middle school (grades 6, 7, 8) will take the Middle School Math Test and the Middle School Science Test. Students in high school (grades 9, 10, 11, 12) will take the High School Math Test and the High School Science Test. Students will have 45 minutes to answer 50 questions on each test. Middle school tests are based on middle school TEKS but focus on critical thinking and analytical skills. They are designed to not require a calculator. High school tests are also 45 minutes long and have 50 questions. They are based on TEKS for typical high-school classes in Algebra, Geometry, Pre-calculus and Statistics (for math) and Biology, Chemistry, Physics, Anatomy & Physiology and Forensic Science (for science). These tests are designed to use calculators and periodic tables. Read more about the 2017-18 changes here: No easy answers – but 3 big new experiments! How does scoring work? Who gets invitations to State? The top six finishers in each test and the top three teams from the Engineering Design Challenge will be recognized. Three teams also receive a special Judges' Choice Award for creative problem solving. One student from each grade level will be recognized as the Ace Award Winner for the highest combined math and science score. Invitations to the State STEM Competition will be coordinated by the Chapter leadership and emailed directly to the TAME Club Sponsor, student, and parent/guardian. Ace Award Winners will be invited to attend the State STEM Competition. Other students may be invited to advance to State based on performance in the Engineering Design Challenge or other criteria. Two special invitations to the State STEM Competition are also set aside for the winners (grades 6-12) of the T-Shirt Design Contest and the Hashtag Contest, both open until February 27th. The two winners of these contests will also receive $100 each and see their ideas and designs featured on shirts, giveaways, and event materials at the State STEM Competition. There is no fee to register or compete in these events. We ask that TAME Clubs provide their own transportation to Divisional STEM Competitions, but TAME provides funding for transportation to the State STEM Competition. What happens at the State Competition? 300 high-achieving students qualify to compete in the State STEM Competition. Just like the Divisional competitions, State participants take a timed math test and a timed science test covering the topics taught in classes they are enrolled in. 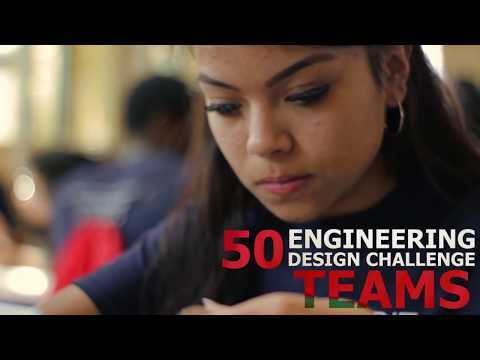 A favorite of many students is the State Engineering Design Challenge, in which we bring together students from diverse backgrounds to engineer a solution to a real-world problem in a timed competitive setting. See past State Design Challenges here. At the State STEM Competition, TAME sponsors cover all costs, including transportation, food and lodging, and great giveaways and prizes. The Competition celebrates TAME students' achievement in STEM and is a chance to meet like-minded peers and mentors from across Texas. I have other plans the day of the event. Can I attend part of the STEM Competition? Due to time constraints, safety considerations and fairness to all students, it is TAME policy that all participants must take part in all the scheduled events of the STEM Competition. We understand there may be schedule conflicts and ask that students make a choice between other plans and the STEM Competition, rather than trying to do both. Students may not take tests early or late, and may not arrive late only to take part in the Engineering Design Challenge. This is to ensure a level playing field and consistent experience for all our students. If students leave early, it is difficult for the event coordinator to keep track and account for participants. Supplies and food are wasted, which makes it difficult to continue to offer this event at no cost to students. In cases of emergency, we ask that the Competition Coordinator be notified so that organizers do not spend time trying to locate a missing student. Students who ignore this policy may be disqualified from the STEM Competition or future TAME events or scholarship opportunities. What is the T-Shirt Design Contest? Each year in February, TAME Club Members from across the state are invited to submit their design for the annual T-Shirt Design Contest. The winning design is featured on the t-shirts, event programs and other materials that will be distributed to hundreds of participants at the State STEM Competition. See past winners here. The winner is awarded a cash prize of $100. If the winning student is in grades 6-12, he or she also receives a special invitation to the State STEM Competition. When and where is this year's State Competition? Check our Competition Schedules & Results page for updates on the State STEM Competition. Results will be posted to the TAME website as soon as possible after each event. Please see our Competition Schedules & Results page for updates. Remember, only students active in registered TAME clubs are eligible to compete. Don't miss out on the fun! Registration is free and only takes a few minutes. Sign up here. For more information about our past or future STEM Competitions, or to learn more about how you can help make sure the competitions stay free for all participants, please contact our TAME State Office. Admin.